Firstly allow me introduce myself. My name is Steve Kessel, a lifelong Gooner from North London, currently living and working in Windsor, Canada. Born into an Arsenal family, the only relative in my bloodline that does not support the Gunners is my cousin, who (as a child) in a misguided attempt at rebellion against my uncle decided to give her allegiance to the scum down the lane. The only thing dumber than that is her stubbornness that has led to her continued support to this day. At least the joke is on her! I met Michael (Gooner.com) at Detroit airport en route to the game in New York. As someone who travels a lot for work, when in an unfamiliar place there is nothing that brightens my day more than the sight of a random walking towards me in an Arsenal shirt. Within seconds we were deep in a conversation about the greatest team on Earth, bound by the universal comradery among Gooners all over the world (the red and white force). Due to the busy wheeler dealer nature of Michael’s life, he has asked me to write the occasional guest blog entry for the site to help keep it current. Like any opinionated Arsenal fan, I have of coursed jumped at the chance. So here is my first attempt, a 2014/15 season preview. With the Charity Shield looming this weekend, the season is nearly upon us. Unlike all seasons in recent memory, we enter this one liberated from the shackles of our trophy drought, and still buzzing from FA Cup victory that ended a testing dry period. I have to say, it’s a great feeling and even the most notoriously negative Arsenal fans I know are having a hard time frustrating me, even managing a smile or two. This has in part been facilitated by the cup victory, but also an active and, dare I say it, successful transfer window (normally a reliable source of bitching material for the negative Gooner alliance). As I see it, heading into the new season, our squad looks to be in pretty good shape. Of all the departures, Sagna was the only one (so far) that I was really sad to see go. He has been one of my personal favorites for some time now. A very complete player who would only annoy me by taking an eternity to take throw ins, thus allowing the opposing team to organise. The blow of that departure, however, was definitely softened by the arrival of his superior (at least in the eyes of Didier Deschamps), along with Calum Chambers and the solid preseason performances of Hector Bellerin. Still, I will miss Sagna, but on the plus side, in addition to the departures of Gervinho and Chemakh, we can no longer be considered the team with the most ridiculous hair styles. Also, we cannot talk departures without mentioning arguably the most significant event of the transfer window, the long long overdue departure of Bendtner, hallelujah! My friends and I used to have a theory that when he wasn’t playing, or had acted like a prat and humiliated the team, Wenger would put him to use manning the Gunnersauras costume. So if you notice a more competent performance from our beloved mascot this coming season, we were right. Of course let’s not forget our other fabulous signing of this summer. Sanchez was undoubtedly a great piece of business. In years past we have regularly been linked with a move for Pedro, who I have never been a fan of. I was always puzzled as to how he was (allegedly) drawing our attention over Sanchez. It seems that, as always, Wenger had a superior master plan, and I don’t think that anyone can question that this acquisition has strengthened the quality and depth right across the front line. I also truly believe that as we move into this new era (post stadium payments) the Wenger factor has been, and will be, pivotal in attracting the world’s best players to North London. Ospina was a very astute acquisition and will push Szezesny all the way. I have a huge soft spot for Wojciech, but also believe that he needs that pressure from a solid cup keeper to push him all the way to greatness. Beyond the excitement of an active transfer window, which at times has left me questioning whether or not I am in the Matrix as something seems not quite right, I think that heading into the new season there is a lot to be positive about the majority of the squad we have retain from last season. Across the back, assuming we have covered our right back effectively, it will be a back five that, despite some disastrous isolated events last season (which cannot be blamed completely on the defensive unit), won the joint golden glove. In midfield we have an embarrassment of riches, which can also translate to strength in depth. Across the front line we have versatility, including (fitness permitting) blistering pace in Walcott, Sanchez and Chamberlin. Couple that with Ozil providing opportunities and on paper we seem unstoppable. I do believe that Ozil will be immense this season too, and I feel he was over criticised last season. Most players would have killed for his stats, but that is the nature and pressure that attaches itself to a high profile signing. And with that let’s acknowledge our three (most in the league) world cup winners. There is still time for some comings and goings in this transfer window. The likely departure of Vermaelen, and an eluded replacement. This mythical defensive midfielder that may or may not arrive. But as it stands, I think we are in good stead. Leading in, we have had a mixed pre-season, but never terrible, and I think the potential is there for all to see. Wenger has a very welcome problem on his hands… squad selection. But there is no one I would rather have at the wheel as we head into battle. We can voice all the opinions we like, but I trust the most complete and educated plan is the one he is formulating right now. Of course it will not be easy. It never is. The teams around us have strengthened too. Chelsea have done some good business, some of which we will not mention, but still I would take Sanchez over Costa. Man U have had a strong preseason and seem to be lining up some big moves. Liverpool I cannot get a good feel for. They were carried by Suarez last time around and despite a lot of business I do not feel they have offset the blow of losing him, but we’ll see. Man City have been relatively quiet, but again the transfer window is not closed. Let’s not forget all those potential banana skins (though I don’t think Southampton is too much of a concern anymore). I feel that the league cup will get less attention and more youngsters now the trophy pressure has been alleviated. However, our young prospects will be a force to be recognised and I think that Akpom has put himself right in contention with a solid preseason run. Let’s hope we breeze through the Champion’s League qualifier against whoever is pulled out of the hat on Friday, as if we do I think we will be a team many will want to avoid this time round. 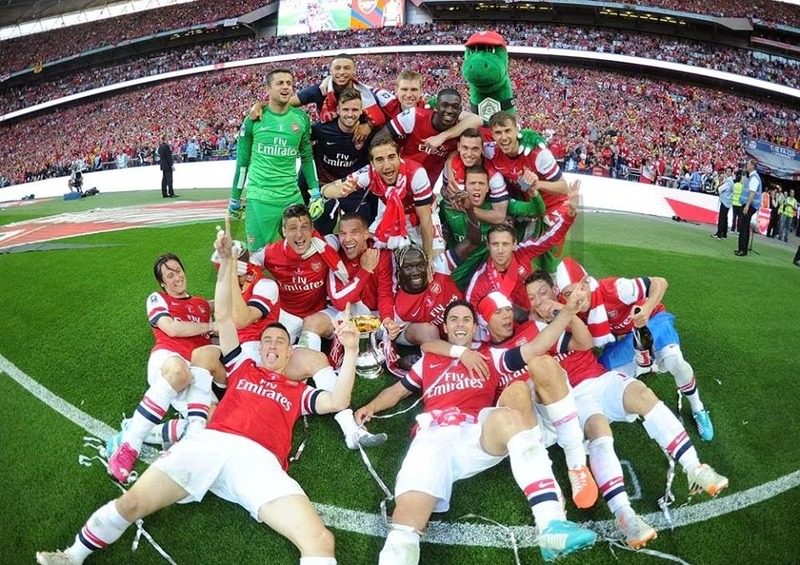 I hope that we have a good run at the FA cup, I would love Wenger to eclipse that purple-nosed spiteful man’s total. Of course what we would all like to see is the champions of England reside back in North London (and let’s be honest, I don’t have to clarify on a team there – I predicts a delightfully early St Totteringham's Day this year). The chances are as good as ever and I think we are in for an exciting season. What I do know is that we are strong, stronger than last year and the strongest we have been for some time. It will be a battle and one I await with eager anticipation.